This is the real benefit of this EU funding programme! Following the referendum in June the concept of Brexit and what it could mean to the UK has been much debated (to read more on it, have a look at the Sport Think Tank website). As we move towards the triggering of Article 50 and kick starting Brexit negotiations, it is important that the UK sport sector has a clear picture of the level of funding it receives from the EU and can seek to retain that level of funding, either through continued participation in EU programmes or through equivalent funding at the national level. 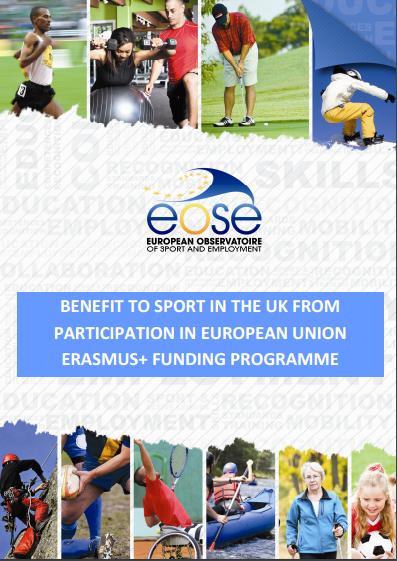 Commissioned by “Sports Think Tank”, EOSE has developed a report on Erasmus+ (European Union programme for education, training, youth and sport, worth €14.7 billion over seven years from 2014 – 2020) funding for UK sport organisations. The report lists various projects and the funding attached to them. Although it is difficult to arrive at a definitive figure of financial support to the UK sport sector from Erasmus+ it is a significant source of income to the sector. The real benefit of the programme is the chance to collaborate at the European level and learn from experiences in Europe. Interestingly, opportunities to collaborate through Erasmus+ may still exist even from outside the EU. TO WHAT EXTENT DO UK ORGANISATIONS BENEFIT FROM ERASMUS+ IN TERMS OF INCOME? Sport has its own budget in Erasmus+ and currently 64 UK organisations are being funded from the 2014, 2015 and 2016 calls for projects (2016 projects were announced on the 20st of September: https://eacea.ec.europa.eu/erasmus-plus/selection-results/sport-collaborative-partnershipssmall-collaborative-partnerships-in-sport-field-and-not-for-profit_en). Funding of €15.3 million was allocated to sport projects in 2014, €15.7 in 2015 and a further €27.4 in 2016 (covering all participating nations). Sport projects in Erasmus+ are collaborative and include partners from several countries, although funding for each project is available, funding per partner is not so it is difficult to know the level of funding to UK organisations through the Erasmus+ Sport chapter. However with 58 organisations receiving a proportion of €31 million over the first two years of the programme it is clear that funding to the UK sport sector is significant. Sport is just one funding stream in Erasmus+, making up just 1.8% of the overall budget. Sport organisations are also eligible to be funded in the other, much bigger, funding streams related to education and youth. One example is Key Action 1 related to employability, mobility and cultural awareness – in 2015 alone 50 UK organisations were funded in the sport and physical activity sector within the vocational education strand with funding of just over €4 million. The funding to sport in the UK through the youth strand is over €100,000 each year. Key Action 2 is about sharing innovative practice at the European level and in the first three years of Erasmus+ over €700,000 has been allocated to UK organisations for sport-based projects (although some of this will be designated to European partners). Even without exact funding details for each UK partner in Erasmus+ projects it is clear that UK organisations are funded for sport-based projects at a level well over £1 million per year. It is clear that working together with colleagues from Europe to find solutions and share best practice on these vital topics in sport can improve the sporting environment for everyone, both in the UK and Europe as a whole. Similar benefits can be seen in projects related to education and youth. Through mobility funding many apprentices and students in higher education have had the opportunity to study and learn abroad. Giving young people the opportunity to learn and gain cultural awareness abroad can make them more rounded individuals, able to deal with different people and be part of an outward looking, tolerant society. It is clear from the list of sport organisations listed in the report as recipients of mobility funding that the benefits of study in Europe are supported by colleagues in the sport sector from across the UK. The UK sport sector participates in a number of collaborative activities at EU level and is centrally involved and influential in a number of EU associations and networks, participating in a range of EU funded collaborative projects led by these associations. 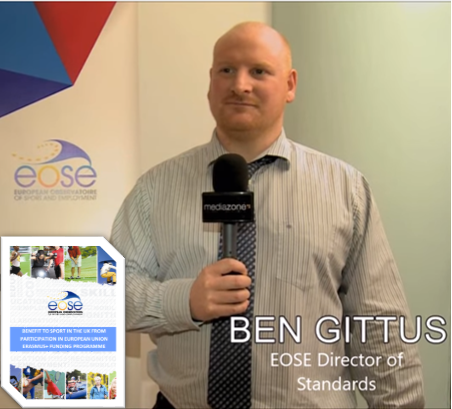 Organisations like UK Active, Sport & Recreation Alliance, SkillsActive and Street Games are involved in EU networks to promote health and physical activity, build links between education and employment, support community development, and promote good governance, gender equality and cooperation between NGBs/ federations. The report summarises current UK and EU advice to those participating in Erasmus+, specifically that “All participants and beneficiaries should continue with their Erasmus+ funded activities and preparation for the published application deadlines in 2016 and 2017“, so business as usual for now. BUT WHAT COULD POST BREXIT PARTICIPATION IN ERASMUS+ LOOK LIKE? This would be determined by negotiations but we can look at the position of other non-EU countries. Participating countries and are divided into two groups: Programme Countries and Partner Countries. Programme Countries include all the Member States of the EU, plus Non-EU Programme Countries of Macedonia, Iceland, Norway, Liechtenstein and Turkey. Programme Countries can fully take part in all Erasmus+ actions. Partner countries include Switzerland and a range of other countries including Albania, Montenegro, Serbia, Armenia, Azerbaijan, Belarus, Georgia and Moldova. Partner Countries can take part in certain Actions under Erasmus+, subject to specific criteria or conditions. So it seems the UK may still be able to benefit from Erasmus+ funding, but the ability to lead projects and full access to the programme could be curtailed post Brexit, depending on the negotiations and the designation of the UK in these categories. In conclusion the funding from Erasmus+ is important to UK sport organisations, but of far greater importance is the chance for individuals and organisations to collaborate, share and learn with colleagues from Europe to develop ourselves, our organisations and ultimately improve sport, the conditions sport takes place in, and the impact sport can have on society.